No matter what you're into, what niche or industry you're in, knowledge is power. As a writer, author, and online marketer, I'm always reading, taking courses, and joining pros in their membership groups. Book marketing and content marketing are part of the turbulent marketing waters. Keeping up takes work, time, and it can be expensive. If you don’t keep your eye on the ball, you’ll fall behind. Your marketing efforts will lose their effectiveness. This will mean less visibility, less authority, less subscribers to your email list, and less sales. As a business owner (if you’re an author or freelance writer, you’re a business owner), you MUST keep up with what's going on in your industry. Granted some industries stay steadfast, but even those businesses must market themselves. This means keeping up with changed or new marketing strategies. Thus, we go back to the title of this post: Knowledge is power. So, where did this quote originate? The 'knowledge is power' quote is attributed to Francis Bacon, in his Meditationes Sacrae (1597). "Today knowledge has power. It controls access to opportunity and advancement." 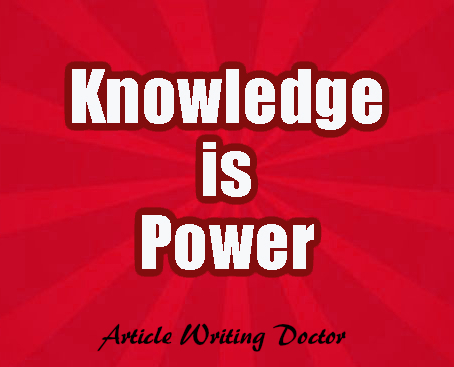 "There are three principal means of acquiring knowledge . . . observation of nature, reflection, and experimentation. Observation collects facts; reflection combines them; experimentation verifies the result of that combination." So, keep learning things that will help you move your business forward.